The media are full of stories of the Chinese government/party decision to abandon the evil one-child policy and replace it with a marginally less evil two-child policy. It is interesting to see the change presented by the authorities as a response to an ageing population, and I’ve seen various commentaries over the last few years suggesting that this easing could make a difference to the economic prospects of China, even perhaps only over the shorter-term as some couples took advantage of the slightly less repressive regime. As a rank outsider, I’ve been more than a little sceptical since I started paying attention a few years ago to birth rates in the rest of Asia, and especially in the wealthier bits of Asia, to which China has been making some progress in converging. As far as I know, in none of these countries have there been direct attempts by governments to suppress, by regulation, the birth rates (indeed, Singapore has been actively trying to encourage a higher birth rate). Here is the time series (from the World Bank database) for China, Japan, and the four other predominantly ethnic Chinese countries/territories (Taiwan, Singapore, Hong Kong and Macao). 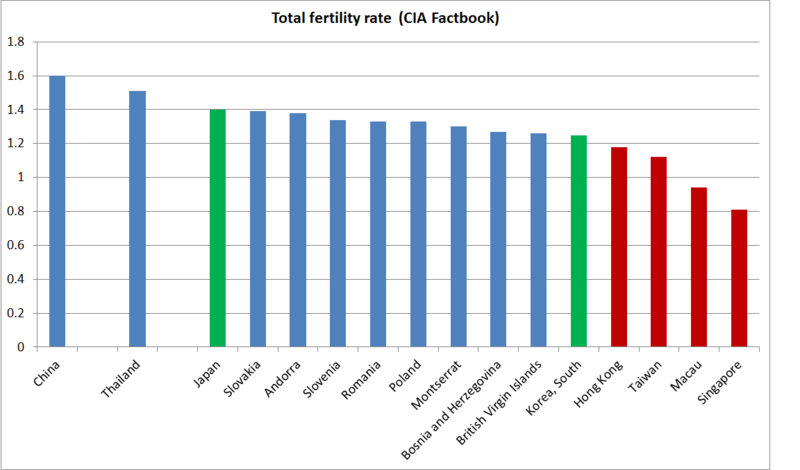 And here, from the CIA Factbook are the countries/territories with the lowest total fertility rates in the world, plus China and Thailand. (The levels are slightly different in the two different sources – the CIA numbers are 2015 estimates – but the broad picture is the same). The countries with the greatest cultural similarity to China have the lowest fertility rates in the entire world – only around one child per woman. The other advanced Asian economies (Japan and Korea) are only a little higher, and one of the other emerging middle income Asian countries (Thailand) already has a TFR below that of China (although, on the other hand, Malaysia’s is higher). 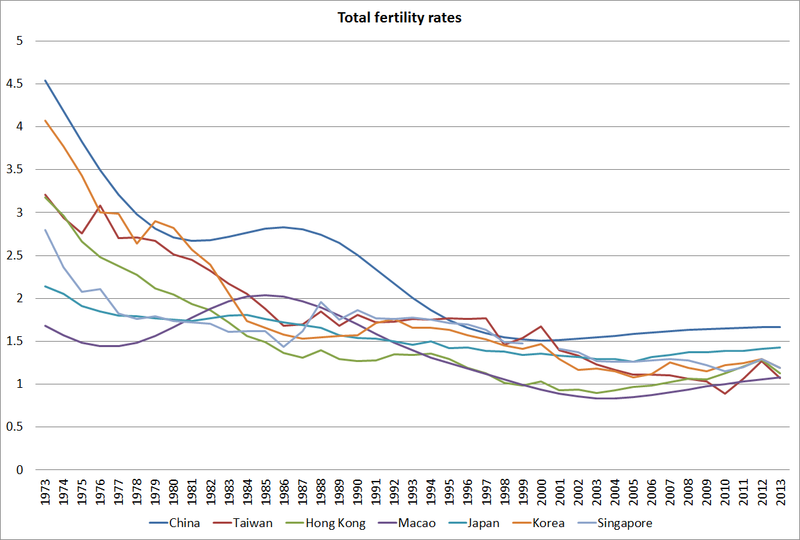 Perhaps the policy change will materially boost China’s birth rate, but it would really stand out relative to the rest of advanced and emerging Asia if that were to happen. ← Who speaks for the 35000 unnecessarily out of work? We are covering this story today. I am very interested in it. Having travelled through China in the mid 80âs one of the most persistent impressions was of parents, uncles, aunties and grandparents doting upon a little fat baby. You could see what a time-bomb social engineering on this scale was. Michael, clearly your proposal of having a NZ falling population by as much as 2% per annum by restricting the Governments new migrant targets from 40k to 15k is exactly the problem that China now realises is a time-bomb in social engineering. A falling population has its share of problem like who is going to fund and look after a aging population that is declining. We are fortunate in NZ in that our population continues to grow. Yes housing is an issue in Auckland due to geography but everywhere else in NZ is very cheap. Huntly only 50 minutes from Auckland is offering land sections for $49k for 900sqm sections. I think there is huge, categorical, difference between a govt policy that controls citizens’ fertility, and the free movement of the citizens of a country in pursuit of better opportunities abroad. As it happens, I don’t think I’ve advocated anything that would lead to a 2% annual fall in the population here – as we discussed the other day, the trend decline might be 0.5% pa, and even that depends on things not turning around in NZ. My argument is that this policy would better support per capita income growth in NZ, and make leaving NZ relatively less attractive (as happened in Ireland). Mitchell Harris, you might be interested in Buy Me The Sky, http://www.amazon.com/Buy-Sky-Remarkable-One-Child-Generations/dp/1846044715.